More interesting than the win/loss record this season will be the attitude of the BYU fan base: seeing what attendance is, gauging the growing dissatisfaction with Bronco, the reaction to watching their rival have a solid year again in a power conference. Nebraska is the most winnable game but you don’t just waltz into Lincoln and beat a storied program. BYU will also be missing players due to suspension from the Miami Beach Brawl. BYU gets Nebraska in their first game with a new coach so that may help. 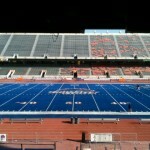 I think Boise State is a flat-out better team and program than BYU. This is essentially BYU’s only real home game of note. If the Cougs do win at Nebraska, Lavell Edwards Stadium will be a mad house for that Boise game and perhaps they’ll have a chance. BYU and Utah fans remember it well – five years ago Utah received word they were joining the Pac-12 and leaving BYU behind. BYU football decided to go Independent. Check out this link to a fantastic read from Stewart Mandel of Fox Sports, one of the premier college football writers. 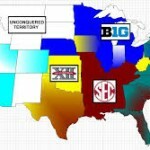 He provides a great summary of all the conference changes and how the affected teams have fared in the 5 years since. It’s a really fascinating break-down. Hard to read if you’re a BYU fan. TCU showed the college football world they really did belong in the 4 team play-off after they put an absolute beat-down on Ole Miss, 42-3. It was not even a game. The mighty SEC West either forgot to show up today or they really weren’t that mighty. Mississippi State suffered a similar fate against a good, but not great Georgia Tech team. Should Alabama lose tomorrow, this whole SEC West was the best is gonna look extremely silly. Boise State showed once again they belong with the college football elite. Their 38-30 victory over Arizona should vault them into a top 15 final ranking. I believe the two best coaches in all of college football will square off when Alabama and Ohio State lock horns tomorrow night. At last check, Bama is a 9 point favorite. Bama has better players but I like both coaches’ ability to scheme a great game plan with a month to prepare. I don’t think Alabama is gonna run away with it. Any of you who’ve read my blog since I started in 2010 will know that I’ve long been an admirer of the Boise State football team. I wrote a lot about Boise and TCU and how their fight for college football legitimacy was the same as Utah’s and BYU’s. Utah has joined the Pac-12 and done well. In honor of the mythical national championship game tonight, I thought I’d post an oldie but goodie. If you’ve never seen this interaction between “Boise” and her teacher regarding her 4th place finish in the spelling bee, you’ll love it. Although Boise State is technically not in the mix this year, little “Boise” represents every team that’s ever been screwed by the system. The video absolutely blasts the BCS for the fraud that it is. It also calls out the voters, the bowl honks that put on the games, the SEC bias and the overall antiquated nature of the system. 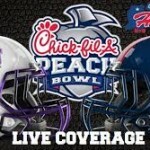 As for tonight’s participants – There is no denying LSU and Alabama are both very good teams. Buy why did Bama get the shot over Oklahoma State? Part of me wants LSU to destroy Alabama and put things to rest. But if that happens, who’s to say Oklahoma State could not have given LSU a better game. Or even one-loss Boise State for that matter. Perhaps you’ve heard Utah Attorney General, Mark Shurtleff has had plans in the works for a few years now to file an antitrust lawsuit against the BCS. An article by Robert Gehrke in the Salt Lake Tribune this morning mentions new developments in the suit. Gehrke sites the exclusion of Boise State in this year’s BCS games as yet another angle Shurtleff and others will use to take their fight to the courts. Apparently Shurtleff is moving up his plans and hopes to have something filed by February of this year. Grandstanding or not, anything that draws attention to what a sham the BCS system is, is a good thing. Check out this fantastic video montage of Boise State’s memorable 2007 Fiesta Bowl victory over Oklahoma. 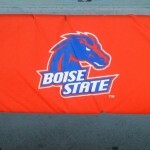 Boise State played in the Las Vegas Bowl last night. Not surprisingly, they destroyed an average Arizona State team, 56-24. This was the last hurrah for the great Kellen Moore. The Broncos and Moore certainly deserved better. Not that Boise State needed another reason to jump ship from the Mountain West Conference and join the Big East earlier this week, but last Sunday’s BCS snubbing certainly pushed them over the edge. As members of the Big East, Boise State will now have a chance to earn an automatic BCS birth (at least for a few years till the whole system changes). They will also be part of a much more visible conference and enjoy all the exposure that comes from the Eastern media, namely ESPN. That lack of exposure is what killed them this year. Yes I know the Broncos shot themselves in the foot with missed field goals two years in a row in critical games. Those misses cost them what would have been two more automatic BCS appearances. However, what also hurt them is falling out of the college football news cycle which is dominated by ESPN. BYU and Boise State, already scheduled to play 4 times beginning next year, will continue 8 years beyond that. Good for BYU for using their independence to schedule aggressively. Again, the 2011 home schedule is a bit lite, but going forward, this game and the Utah game should line up as home games in the same year. Who wouldn’t want to see Boise State come to Lavell Edwards stadium every other year. The Broncos are one of the most exciting teams in college football. As the great conference shake-up of 2011 unfolded, a lot of attention was deservedly given to former non-AQ schools, Utah and TCU for joining, or announcing they’ll soon join BCS conferences. BYU also garnered a lot of press with their declaration of independence. The non-AQ team that kind of got lost in all the madness was Boise State. They quietly shifted from the WAC to the Mountain West. Lest we forget, the Broncos have been the poster child for non-AQ success and don’t look now, but they are set up for a title run again this year.